For children from 15kg (33lbs) - 36kg (79lbs). Maximum protection thanks to it's large wrap around headrest. Independently adjustable headrest (height and width) and backrest area (width) to accomodate a growing child. Reclining backrest and adjustable armrests. The Montecarlo R1 is specially designed to adapt to each stage of your child’s growth. 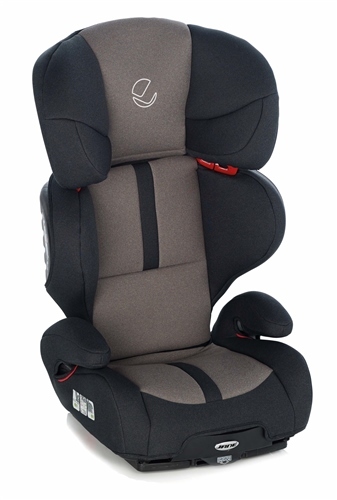 Suitable for children between 15 – 36 kg, this Group 2 – 3 car seat has an integral adjustment system that allows both the seat’s height and width to be altered for a perfect fit, effectively protecting your child during all stages of growth and accommodating for different thickness of clothing depending on the days weather. You can extend its usage even further when used with Jané’s optional Xtend impact shield, a protective cushion that provides a safe and comfortable alternative to a harness. With the Xtend it can also be used as a Group 1 car seat, effectively extending the seats range from Group 1-2-3, 9 to36 kg, 9 months to 12 years approx. This car seat’s unique aluminium structure improves protection by 70% when compared to a traditional system and is also equipped with an ISOFIX anchoring system for the base of the seat, which combined with 3-point seat belt, obtaining greater stability. Offering greater cushioning, the larger wrap around headrest increases shock absorption that’s caused by an impact. The reclinable backrest and tilting sides provide optimum support for a restful journey and the aeration vents with the internal fabrics are breathable to maximise your child’s comfort. Montecarlo R1 is independently tested and approved under new European Car Safety Regulations ECE R44/04. This excellent seat was also subjected to the strict EUROTEST exam, which tests the safety and resistance of all the child safety seats on the market. It received one of the best scores on the market in its category, and an “excellent mark” with special mention made of its “safety in side crashes” and the “stability of the seat”. Install the car seat directly with the vehicle 3-point seat belt and optionally the car seat can be secured with the Isofix anchors. The child is held secure with the vehicle 3-point seat belt. Isofix fastening system gives extra safety and stability. Very adaptable -height, armrest, sides and body all adjustable. Suitable for: Group 2-3, 15-36kg, 3 to 12 years approx. Adaptable: a Multi-Group Safety Seat that easily adapts to your growing child thanks to its integral adjustment system. Optional Xtend impact shield allows this Group 2-3 car seat to cater for Group 1. Meaning the car seat can effectively be used from 9 to 36 kg, 9 months to 12 years approx. Anchored to the car via the standard Isofix system and the child is secured in the seat with the 3-point seat belt, obtaining greater stability. It can also be installed with just a 3-point seat belt. The aluminium structure improves protection by 70% compared to traditional systems. Height and width of the sides of the headrest and the backrest areas are independently adjustable. Maximum protection thanks to the improved large wrap around headrest and side shock absorption. Seat belt route means the cars diagonal belt adapts perfectly to the height of the child’s shoulder. Ergonomic design and ventilation maximises comfort. Certified to European Safety Regulations ECE R44/04. Side impact tested, impact approved. our almost 4 yr old was just coming up on 18 kg so needed to go into a booster, i automatically looked at jane first as after doing a lot of research when she was small the jane exo came out tops for safety, which is what we purchased then. I wanted an iso fix booster also for safety reasons so the monte carlo r 1 was perfect. ordered the petite chat one for a little girl, didnt fail to impress! seats are well padded comfy to sit in had added advantage of recline tho she hasnt fell asleep in seat yet. plenty of head protection and high deep side wings. Backrest also adjusts very easily would def reccommend this seat as it is very safe, comfy and easy to fit in car. covers are also water repellent, and all strip off easily for washing. The only thing i could suggest adding would be a pop out cup holder, but i wouldnt not buy seat because of it! Great car seat that's ISOFIX compatible. Safer but also I love that I don't have to keep remembering to get out of the drivers seat to belt it up again when it's empty when I leave the kids off at school. Most parents should know when you unbelt a booster seat to get your child out of the car, you need to belt it again because it will be loose in the back of your car and could cause fatal injury in an accident. It's so easy to move between cars, and much lighter than previous car seats that I've used in the past. Hi could you confirm the depth of this seat please? I'm getting conflicting dimensions from various websites.